Thursday, October 3, 2013, 5:00 p.m. to 7:30 p.m.
Join Cultural Programs of the National Academy of Sciences and the Washington Conservation Guild for an evening of talks about the conservation and restoration of the 1924 National Academy of Sciences Building on Constitution Avenue. Designed by the renowned architect Bertram Grosvenor Goodhue, the building features a wide array of Art Deco elements and finishes including world-class decorative painting, gilding, marquetry, and bronze work. Beginning in 2010, the building underwent a complex and multi-faceted effort to conserve, restore, and rehabilitate its spaces and finishes. The two-year project enlisted a wide range of professionals associated with the conservation and preservation fields. Maria Bonet will speak about the conservation of architectural woodwork and marquetry; Michael Kramer, President of the Gilder's Studio (Olney, MD). will speak about the conservation of gilded finishes; Jacquelyn (Lindy) Gulick, Conservator at Conservation Solutions, Inc. (Washington, DC), will speak about the restoration of exterior bronze elements, and David Olin, Chief of Conservation at Olin Conservation, Inc. (Great Falls, VA) will speak about the conservation treatment of two murals by Albert Herter, Prometheus and Lincoln and the Academy Founders. The evening will begin with a reception at 5:00 p.m. in the Great Hall, followed by the speakers' presentations beginning at 6:00 p.m. in the Auditorium. Attendees will have the opportunity to see the Great Hall, Board Room, and Members' Room after the presentations. 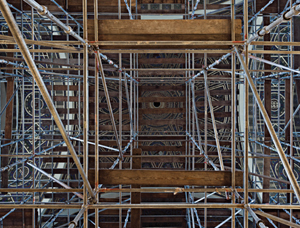 Image: Gregory Vershbow, National Academy of Sciences, Great Hall Restoration, 2011, archival inkjet print, 30 x 40 inches. Collection of the National Academy of Sciences.